We're stoked to announce a new feature here on Singletracks called "My Bike." My Bike pulls together some of the features we've had for a while like Sweet Bike and My Bike Photos into a shareable profile for each of your rigs. Each of your bike profiles is linked on your member profile page (here is an example). Profile pages show photos of your bike (as many as you like! ), the bike weight (optional), and the components you're running along with any (optional) parts notes you add. 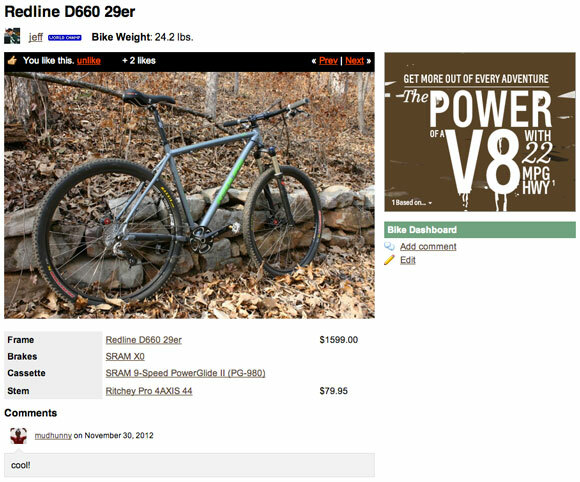 Singletracks members can comment on your rig and "like" it to show approval. When viewing your own bike profile there is an edit link on the right side of the page so you can make changes. Once your bike profile page is set up it's easy to share the link on forums (great for asking upgrade questions) and to keep track of things like parts life, cost, etc. You can add your bike using this link (found on the left side of your My Account page) or by clicking the My Bike link on the right side of any bike review listing. The first step is to select your frame; after that you can upload photos of your bike and spec out your build (you can always access this page through the edit link on your bike page). Moving from top of bottom on the edit page, the view bike link takes you back to your public bike profile page; the delete bike link will delete this bike if you need to start over. Click the pencil icon next to your bike's title to enter bike weight, a custom title, and the year you bought your bike. Roll over the photo thumbnails to reveal the X icon (delete photo) and the pencil icon (edit photo, add caption). There's also a link below the thumbnails that allows you to add more photos. Click to watch (or unwatch) your bike. Watching sends you an email whenever your bike gets a new comment. Parts entry: choose the part category from the menu, then start typing the name of the part. If you don't see your part, click "Add part..." at the bottom of the list. You can optionally enter the date you installed each part, the price you paid for the part, and any notes or details about the part (size, style, color, etc.). Click "Save" to add. 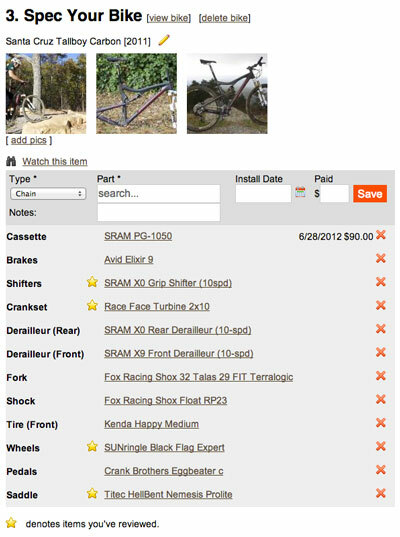 Your parts list is just below the add parts form; click the X icon to remove a part. A star beside the part name denotes that you've posted a review of this part. Get started spec'ing your bikes today and stay tuned for more My Bike related news later today and on Monday!